I really like the way you take RA2 tech and mash it with present day methods and standards of war machine design. Effectively giving RA2 that semi realistic vibe of RA. I like it, but I won't say anything else until I know what it looks like in RA2. Oh, and Mortecha's post is correct. Why are there 41s in the Prism Tank's body? 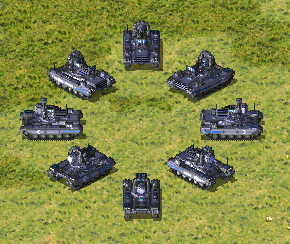 BTW, if this one is the same as that Prism Tank in Allied MBT topic, then you need to fix black dots to get spotlighted. I think I saw this in the screenshot you took of the MBT. Great voxel, although the front of the turret looks funny to me. Here's an ingame screenshot. It looks awesome, but a little dark. I think it actually looks TO detailed. Ingame, it looses detail and gets all messy. It's also filled with black dots and stripes. Time to get out my 'Agreeing with TB' hat. I threw mine out the day he said he was better than me at mapping (even though we all know he's not ). Excellent voxel, as always. This only means more for me to post in the news. Why is this not spotlighted yet!!! Along with the rest of Sprite/Longwall/Shin.peter.pan's work... (I'm assuming they are all the same person). This. It's a shame, really. Why is this spotlighted? I'm sorry, but I only see one vote for spotlight and it DOES look messy ingame. It'd need some fixing up before being spotlight quality. Actually there are 2 votes for spotlight. I see very little messiness in this voxel, personally. Not spotlight-worthy once it's ingame. It's just not what it is in the voxel viewer. Voxel viewer shots do NOT count, people please hold back before voting for a spotlight until in games are seen. I vote un-spotlight until Sprite improves this..